The distribution of BlackBerry 10 OS versions has been mostly unchanged for over a year now, and November was no different. Furthermore for these waiting for the much delayed 10.3.3 there is no sign that it is starting to get rolled out. 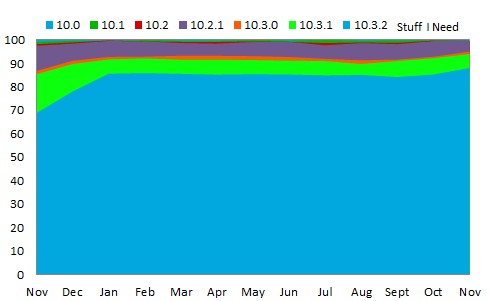 The number of 10.3.3 users in November was the same single digit number as it was all the back in June. BlackBerry 10 is appearing as static as you would expect an abandoned OS to be. This data was collected by BlackBerry World for downloads of the free strategy game Pixelated and the free checklist app Stuff I Need. Data shown on the chart is from the beginning of November 2015 through the end of November 2016.